January 22, 2014 | Lens cap....off! One of the things that I’ve found a bit annoying about my user’s manual is that, while it tells me how to change various settings, it doesn’t tell me *why* I’d want to change it. Here’s a small example of what I mean: “Adjust the metering method (how brightness is measured) to suit shooting conditions as follows…” So, why would I want to do that? What benefit will that give me by fussing with the metering method? Maybe my user’s manual assumes that the person reading it Has A Clue. Sadly, I Don’t Have A Clue. This is a problem. Not only will I have to learn what my camera can do, I will have to learn the associated why’s and why not’s. I found my camera on the Portrait mode, so I decided to take a portrait shot of my beautiful dog. Harley is going to be 11 this summer. 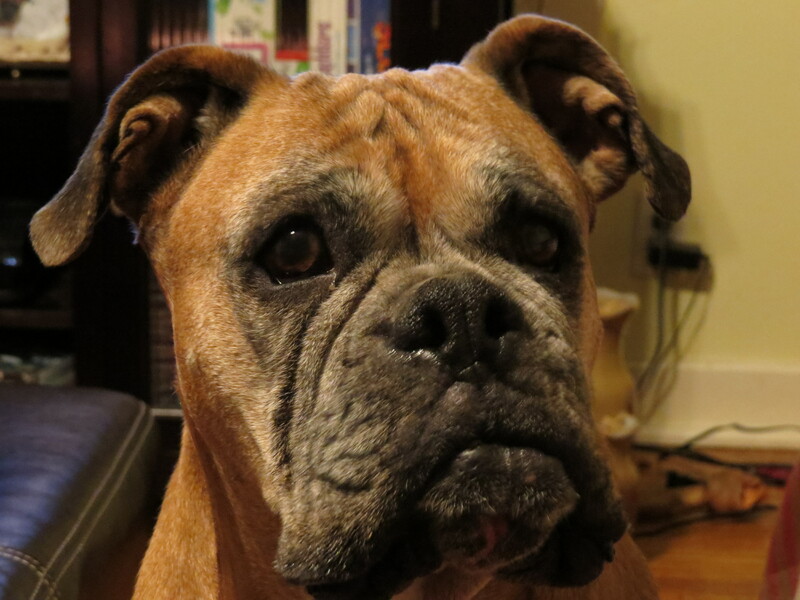 That’s pretty old for a boxer, and she’s the best possible dog I could have asked for. She is, in equal parts, both the smartest and dumbest dog on the planet. I think this behavior is encoded in doggy DNA so they can keep their Grand Plan away from us humans. But some of us are catching on. My beautiful puppy who’s no longer a puppy. Harley Blu you are such a sweet doggy !